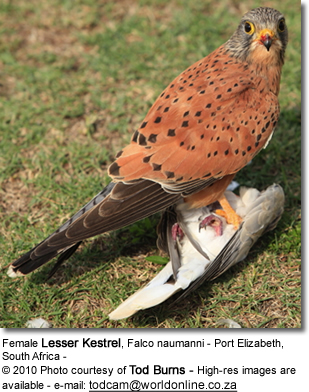 The name kestrel is given to several different members of the falcon genus, Falco. Plumage typically differs between male and female, and (as is usual with monogamous raptors) the female is slightly larger than the male. This allows a pair to fill different feeding niches over their home range. Kestrels are notable for usually having much brown in their plumage. 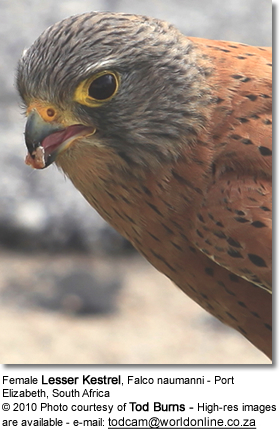 Kestrels are bold and have adapted well to human encroachment, nesting in buildings and hunting by major roads. Kestrels are most easily distinguished by their typical hunting behaviour which is to hover at a height of around 10–20 metres (33–66 ft) over open country and swoop down on prey, usually small mammals, lizards or large insects. Other falcons are more adapted to active hunting on the wing. Kestrels require a slight headwind in order to hover, hence a local name of windhover for Common Kestrel. Their ability to spot prey is enhanced by being able to see ultraviolet which is strongly reflected by vole urine. 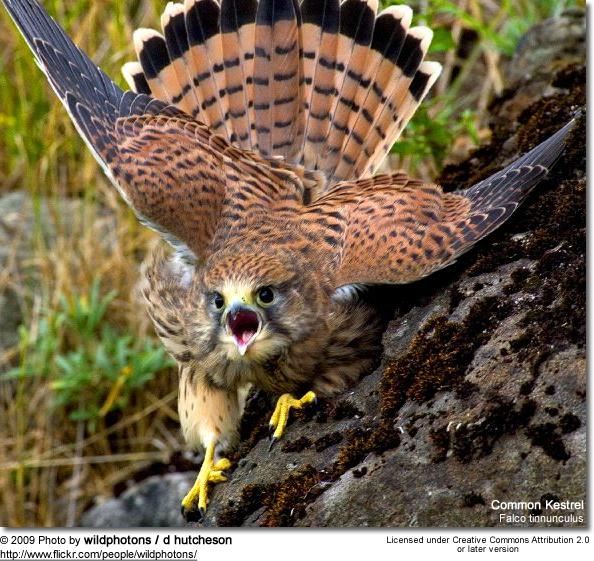 Kestrels do not build their own nests, but use nests built by other species. The most basal "true" kestrels are three species from Africa and its surroundings which lack a malar stripe (a line angling back from the bird's chin, separating the cheek from the throat) and in one case have—like other falcons but unlike other true kestrels—large areas of gray in their wings. More enigmatic is a group of 3 predominantly gray species from Africa and Madagascar. These are usually considered kestrels due to their general shape and habits, but are probably more quite distinct from the true kestrels. 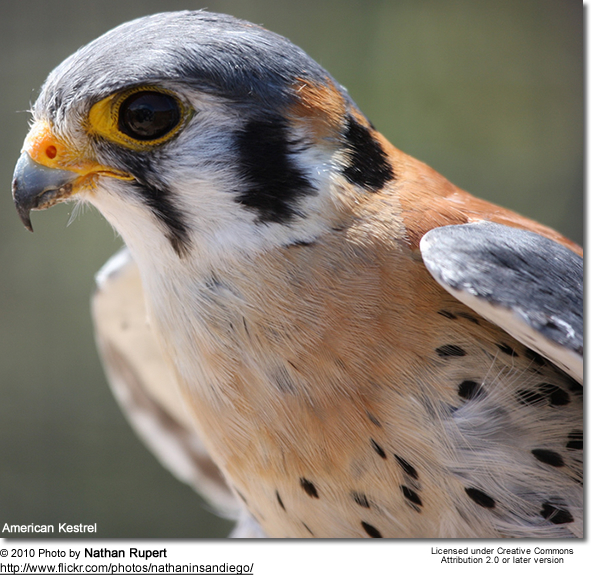 The American Kestrel is the only New World species termed "kestrel". Actually, the molecular data of Groombridge et al. (2002), as well as morphological peculiarities (like grey wings in males and a black ear-spot) and biogeography, strongly support the view that this species, among the Falco falcons, is not a kestrel at all in the phylogenetic sense but perhaps closer to the hobbies. 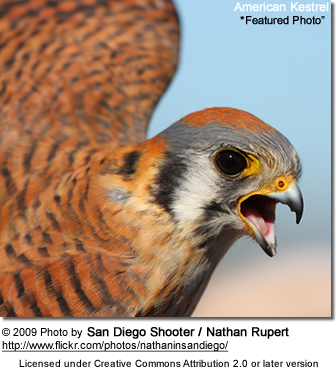 Most species termed kestrels appear to form a distinct clade among the falcons, as suggested by comparison of mtDNA cytochrome b sequence data (Groombridge et al. 2002) and morphology. This seems to have diverged from other Falco around the Miocene-Pliocene boundary (Messinian to Zanclean, or about 7–3.5 mya). 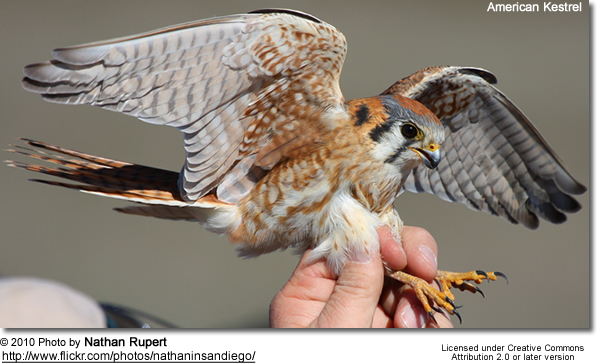 Approximately during the Gelasian (Late Pliocene or Early Pleistocene, around 2.5–2 mya), the main lineage of true kestrels emerged; this contains the species characterized by a malar stripe. This too seems to have evolved in Africa and subsequently spread across the Old World until they reached Australia some time during the Middle Pleistocene, less than one million years ago. This group contains several taxa found on Indian Ocean islands. Copyright: Wikipedia. This article is licensed under the GNU Free Documentation License. It uses material from Wikipedia.org ...Additional information and photos added by Avianweb.